The most talked-about journalism of this week wasn't produced in the New York Times, CNN, Newsweek or NPR. It was Jon Stewart's epic, eight-minute takedown on Wednesday night's Daily Show of CNBC's clueless, in-the-tank reporting of inflatable bubbles and blowhard CEOs as the U.S. and world economies slowly slid into a meltdown. You can quibble about Stewart's motives in undertaking the piece -- after he was spurned for an interview by CNBC's faux populist ranter Rick Santelli -- but you can't argue with the results. The piece wasn't just the laugh-out-loud funniest thing on TV all week (and this was a week in which NBC rebroadcast the SNL "more cowbell" sketch, so that's saying a lot) but it was exquisitely reported, insightful, and it tapped into America's real anger about the financial crisis in a way that mainstream journalism has found so elusive all these months, in a time when we all need to be tearing down myths. As one commenter on the Romenesko blog noted, "it's simply pathetic that one has to watch a comedy show to see things like this." But that's not all. The Stewart piece also got the kind of eyeballs that most newsrooms would kill for in this digital age -- planted atop many, many major political, media and business Web sites -- and the kind of water-cooler chatter that journalists would crave in any age. In a time when newspapers are flat-out dying if not dealing with bankruptcy or massive job losses, while other types of news orgs aren't faring much better, the journalistic success of a comedy show rant shouldn't be viewed as a stick in the eye -- but a teachable moment. Why be a curmudgeon about kids today getting all their news from a comedy show, when it's not really that hard to join Stewart in his own idol-smashing game? 1) Great research trumps good access to the powerful: The Stewart piece makes this controversial but critical point in two different ways. For one thing, the story shows how access to the nation's most powerful CEOs -- supposedly the big advantage of a journalistic enterprise like CNBC -- isn't worth a warm bucket of spit when it results in slo-pitch softball questions, for fear of offending the rich and powerful. And so we see Ford's CEO grilled about Kid Rock's performance at the auto show, Ponzi scammer (later revealed) Alan Stanford quizzed on whether it's fun to be a billionaire, and Maria "Money Honey" Bartiromo gushing at how corporate chiefs were still telling her that their companies were doing great, even as the massive iceberg was casting its shadow over the hull of the American economy. Jon Stewart's act of journalism -- reported, of course, by his ace team of writers -- worked because there were no interviews at all. It all hung instead on meticulous research, dredging up lethal quips of CNBC's stock pumping hosts to hang them with their own undeniable words -- Jim Cramer's "buy buy buy" when the Dow was roughly double what it is today, his touting of Bear Stearns' and Bank of America's doomed stocks. The kind of research that's so hard for most newspapers to do anymore, with downsized staffs and ever-looming deadlines, but which can so often belies the spin from our "accessible" sources. 2) The American public is mad as hell right now, so why isn't the mainstream media? Balanced reporting is important, but a balanced, modulated tone of voice? Not now, not when millions are hurting from lost jobs and under-water mortgages, and many millions more are living in fear of the same fate. People need information but what they so desperately want an outlet that shares their passion -- and, yes, that rage -- and so Jon Stewart gave people what they weren't getting anywhere else. 3) Tear down this wall... of pretending that the media itself isn't a major player in American society, and isn't a factor in most big stories. Sure, there were greedy bankers and their pocketed politicians working in unintended tandem to take the Dow from 14,000 down to 6,600, but these popular TV pundits were there every step of the way, as The Daily Show revealed, and their contribution was consequential. Mainstream media, after all these years, has a hard time understanding that one of the major political forces in this country is mainstream media, something the audience knows all too well. 4) The First Amendment doesn't say anything about not being funny, or not being passionate. I don't know about you, if you actually watched the piece, but I feel like I learned something important -- confirming the cheerleading nature of the nation's most-watched source for business news, even in a moment of oncoming disaster -- but I also busted my gut laughing as I did. And there's nothing wrong with that, informing and entertaining at the same time -- isn't that what newspapers are charging people 75 cents for?. You know, sometimes people do some crazy stuff when they realize their days are numbered. I don't have the answers to problems facing American journalism -- not my own newsroom, mired in Chapter 11, nor the others that face a possible death sentence. But fighting for life will mean living each day like it was your last, with passion, anger and laughter, the way The Daily Show shined a light on a crevice of the nation's battered economy on Wednesday night. 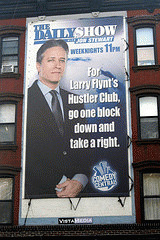 View Jon Stewart's CNBC Video here. She Warned America That Russia Hacked Our Voting Rolls. Why Is She In Jail?